Caroline Abels moved into her 1907 house in Montpelier last May and immediately began assessing what needed improvement. The 37-year-old editor of Local Banquet, a Vermont farm-and-food magazine, was fond of the abode and wanted to preserve its look while increasing its energy efficiency. So she had the plaster walls taken down and replaced with insulation and drywall. She had the wood floors stripped. She considered adding more attic and basement insulation on an energy auditor’s recommendation. But it wasn’t enough. As the weather got colder, Abels was concerned about the drafts she felt at the windows. The house sits in a neighborhood packed with late-Victorian beauties, all with numerous, distinctly designed windows. Some in Abels’ house were original; others had been updated in the 1940s. Storm windows had been added at some point. Even so, she says, all were “drafty, they didn’t move up and down well, and they were not in good shape.” Her first thought was to replace them. Then she heard about Christopher Pratt, owner of a window retrofit business in East Montpelier called Open Sash. Pratt and his sole employee, Jamie Weiner, are now hard at work on Abels’ many windows. His “window wagon” sits in her driveway: The small trailer contains materials, tools and his “window pony,” a vertical clamping structure for working on individual windows. The spare-looking outfit illustrates a fundamental value of Pratt’s enterprise. His work involves “20 percent materials, 80 percent labor.” The new-window option has the opposite ratio, he asserts. Open Sash’s approach makes for less waste and, eventually, he hopes, more local jobs. Inside Abels’ house, Pratt points out a bay where three Queen Anne-style windows have been removed for retrofitting. He describes the absent windows as “six lights over one” — that is, six small panes divided by a wooden lattice on the top half and one large bottom pane. One aesthetic advantage of retrofitting windows with “divided lights” is that the method preserves the character and look of the old window. Fiberglass replacements would suspend simulated dividers between front and back layers of glass. But Pratt is concerned with more than aesthetics. The 54-year-old, who grew up in New York City and Connecticut, had a deeper motive in starting Open Sash: He aimed to put the “replacement-window bogeyman” out of business. Pratt is appalled that the federal government incentivizes buying new replacement windows. The “consumer energy efficiency” tax credit it offers — 10 percent of the windows’ costs, up to $200 — fails to take into account the energy expended and the carbon released into the atmosphere during manufacture. Building new is simply less “green” than conserving and improving existing structures, Pratt insists. But federal policy is weighted toward new construction — an important economic indicator in this country. Even established whole-building efficiency-rating systems, such as LEED, were devised for new construction. Tax incentives for retrofit-efficiency approaches such as Pratt’s are unimaginable without a paradigm shift. Pratt earned an environmental studies degree at Middlebury College and turned down a spot in the University of Vermont’s medical school to pursue a master’s in forest science at Yale. He used his experience for land management, but soon found more jobs, and creativity, in building. His varied building career encompassed constructing Native American sweat lodges and the Central Park gazebo at 58th Street and Fifth Avenue in New York City. Along the way, he learned cabinet-and furniture making. While living in Portland, Ore., before his move to Vermont in 2009, Pratt began to specialize in windows. 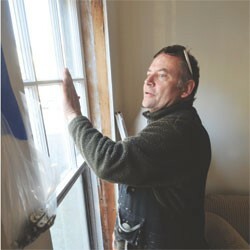 There, he says, “I discovered that it made a lot more sense to restore a window if you can make it as energy efficient as a new window.” His concern for the environment is clear on the Open Sash website, where Pratt posts thoughts about such topics as the increasing acidity of the oceans, and the Kenyan environmentalist and Nobel Laureate Wangari Maathai. Pratt asserts that his window treatment halves the U-value (a heat-loss measurement) of the window. He hasn’t submitted his product for testing by the National Fenestration Rating Council, so he can’t offer exact numbers. But old, single-pane windows tend to have a U-value of about 1, while the best new windows average around U-.3. If Pratt’s estimate is correct, a rating of U-.5 is a distinct improvement. Aside from efficiency, Pratt touts the practical and aesthetic benefits of his method. Open Sash essentially integrates a storm window into each sash by nailing and gluing a thin wooden frame, containing the extra pane of glass, onto the original one. This allows homeowners to open and close their windows as the weather fluctuates without also adjusting the storms. At the same time, it conserves the unique waviness of old glass and other vintage features, and makes the wood components look new. The approach appeals particularly to homeowners whose storms are not working correctly or who find them unsightly. Pratt’s method has two groups of doubters, however. Energy-efficiency specialists, such as senior energy consultant T.J. Holloway at Efficiency Vermont, tend to see energy upgrades in terms of their cost effectiveness. Because windows are such an expense — Abels would have paid $600 each for new fiberglass windows; Pratt charges between $450 and $600 per window — they tend to rate low on these specialists’ lists. Window upgrades also have a relatively small impact on a house’s overall efficiency, compared with insulating the attic and basement. “There’s usually something else in the house you can find, but if you’ve done everything possible,” says Holloway, then doing the windows makes sense. The other group of doubters consists of preservationists. Pratt’s methods are considered too invasive in the strict world of historic preservation. Pratt insists on the integrity of his retrofit. “I sand it down and nail and glue it, so it becomes, to me, the most long-lasting, solid method. For strict historical windows, I would do something more reversible,” he assures.